Sweet Millie's Bakery is a wholesale bakery located in Berkeley. They make mostly cookies, including the classics (chocolate chip, oatmeal raisin, and rainbow M&M), plus a vegan cookie, along with brownies and coffee cake. They distribute all over the Bay Area, mostly to coffee shops. Most of their items aren't particularly interesting to me, since I'm not a big cookie fan, but, a while ago I stumbled into Nervous Dog Coffee in Bernal Heights (which, sadly, is now closed), and I wanted a treat. I didn't see anything I really wanted, since, cookies aren't my thing, but they were offering free credits on LevelUp, so I took a gamble. Peanut Butter Chocolate Dipped Cookie. $2. While I don't necessarily like cookies, I do like chocolate, and I sure love peanut butter. 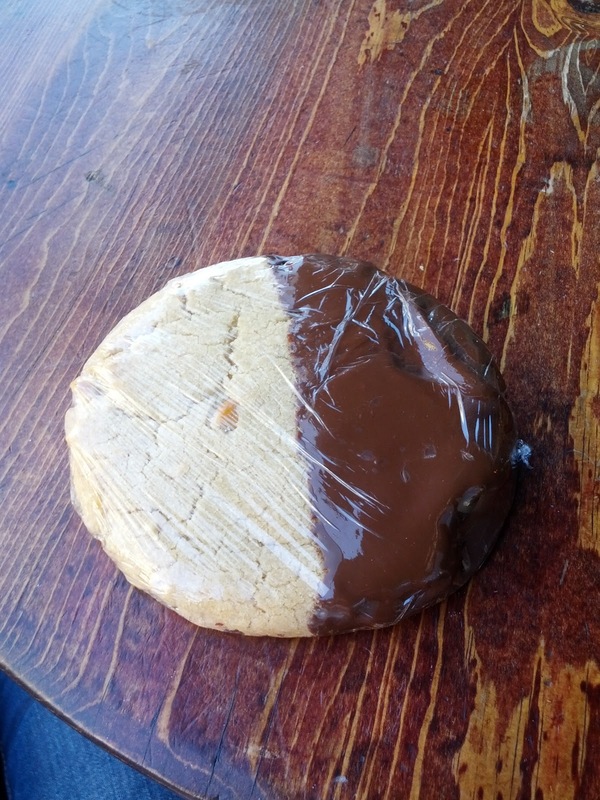 A chocolate dipped peanut butter cookie sounded like pretty much the best type of cookie there could be. It was a very large cookie. It had decent peanut butter flavor, with little bits of peanut in it, and a bit of salt to amp it up. It fell right in the middle of the soft vs hard spectrum, harder than I'd like, but not crispy. The chocolate coated side had a very thick layer of chocolate, which of course paired perfectly with the peanut butter. It was a decent cookie for what it was, but not particularly remarkable. The cookies were all individually wrapped to maintain freshness, which seemed to work, but I'm sure this was at least several days old. I wouldn't get another, but the $2 price for such a large cookie was reasonable. I recently took a very short trip down to Santa Monica, CA. Why Santa Monica? Well, Ojan needed to visit our office there for work, and I .. well, I wanted to go somewhere warm? I cashed in some airline miles, paid $11 in fees, and was able to enjoy a short getaway to a beach town. I think it was a good move on my part. Since the trip was so short, and mostly during the work week, we had exactly one day (Sunday) free to see the beach, explore, meet up with Ojan's college roommate and his wife. And of course, to eat some food. 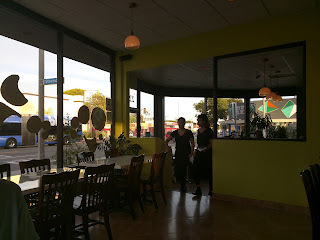 Once we made plans to see them in the afternoon and go to dinner, I was excited to do a little research and find a great place to eat, but then they dropped the bomb on me: they are vegan. Uh ... vegan? Now, I was a vegetarian in a past life, so I certainly understand not eating meat. But how do you give up butter, cream, cheese? All the things I consider tasty? I did some quick research, but kept coming up short. Everywhere that sounded amazing to me seemed unlikely to match their interests. Finally, I found Satdha Plant-Based Thai Kitchen, located only a few blocks from where we staying. Satdha sounded promising, although, yes, entirely vegan. Part of the appeal, besides the positive reviews, was the cuisine: thai. I wanted food where I wasn't going to feel the compromise of going vegan, aka, I didn't want to get pizza and have strange vegan cheese. 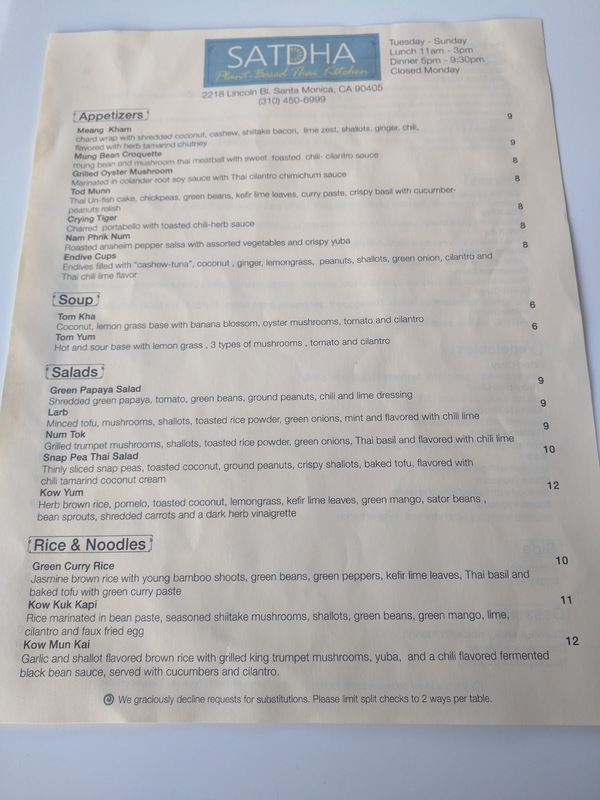 I wanted a place where vegan cuisine feels more natural, and for me, I generally eat vegetarian at thai restaurants anyway. Plus thai food is full of spice and flavor, so you can do without the added fats. So, to Satdha we went, for dinner, as a group of four: Ojan and myself, and two vegans. Satdha does not take reservations for groups less than 6 people, so we showed up a bit early (6pm), and were easily seated. Service was good, the space was nice, the food was ... ok. The meal started strong with one dish I loved, but the rest were fairly lackluster, and the desserts disappointed. It was a nice choice for a healthier meal, particularly since Ojan and I had the polar opposite meal for lunch, when we got our fill of meat, cheese, and decadence with the epic burger from Father's Office. I wouldn't return, but, it was fine. Welcome to the LA area. 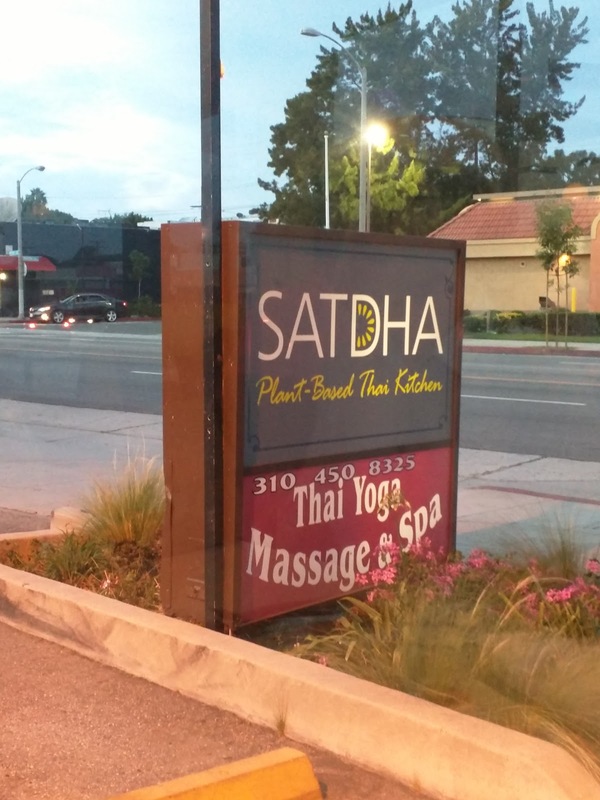 Satdha is located off the side of a busy street, in an area that is all strip malls. I can't say I particularly like this town. You can't see in this awful photo, but, the decor is actually quite bright and lively. The walls are painted various shades of green. On the walls are vases with large dark green leaves in them. The floors are a pinkish tile. The interior really has a decent vibe to it, open, and airy. The color from the walls doesn't translate onto the table. 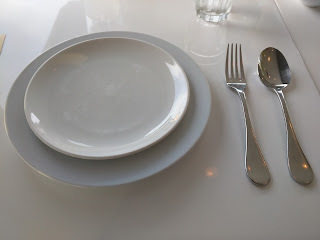 Shiny white tables, white plates, basic silverware, clear water glasses, wooden chairs. Where did the fun go? It took a while to take the whole menu in. We knew everything would be served family-style, so we needed to make decisions as a group. The appetizers were the most appealing part of the entire menu to me. I kinda wanted them all. I love meaty mushrooms, so the grilled oyster mushrooms jumped out immediately (but, others weren't as interested). I was really curious about the Tod Munn, described as "Thai Un-fish cakes". Or the endive filled with "cashew-tuna". But alas, my dining companions weren't crazy about any of these. 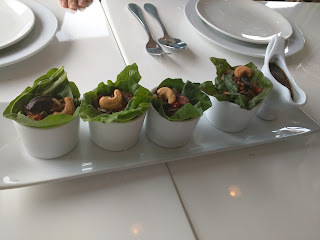 My first choice of appetizer, meang kham, they were willing to get, and I went along with the suggestion for mung bean croquettes since they really wanted them, even though I dislike legumes. 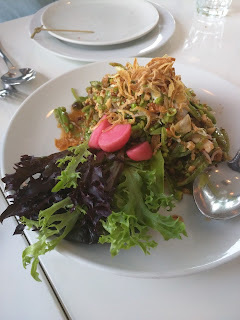 We also picked one salad, a snap pea thai salad that I read good reviews about. 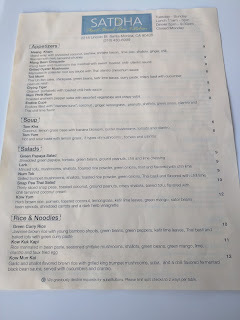 We skipped the soups and rice dishes, and flipped over to another full page of options. Noodle dishes, entrees, vegetables, basic rice, and desserts make up the flip side. 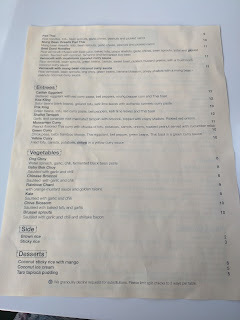 The "vegetables" category was pretty easy to rule out (although, well, the entire menu is actually vegetables ...). These items were all basically just sautéed green side dishes (aka, ong choy, bok choy, chard, kale, etc). Entrees were mostly curries, plus a signature dish of "catfish eggplant" that I had read about. Catfish eggplant went on our list as the sole entree choice. The noodles group contained one dish I was particularly interested in since it gets great reviews, beet dyed noodles, a dish of rice vermicelli infused with beet juice, with all sorts of goodies like yuba, crispy shallots, and coconut, but the others didn't really seem interested in noodle dishes, so I didn't press on it. The server seemed to think our order was small, only 2 appetizers, one salad, and one entree for 4 people, but I assured her this would be fine, and we could order more if we needed. We of course planned to order at least two, if not all three, of the desserts later. And honestly, I was still full of that amazing burger! 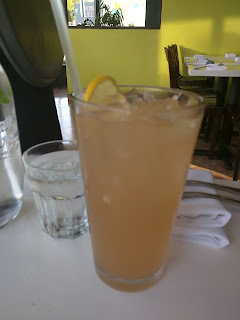 Ojan opted for a lemongrass lemonade, a house special. Whenever a place has an interesting non-alcoholic offering, he always likes to try it, since he misses out on alcoholic cocktails. Sadly, this did not impress. Ojan really likes a tart lemonade, so he found this far too sweet, with not nearly enough lemon flavor. He pushed it away, and I tried it, thinking that the sweet would at least appeal. I didn't like it either, but for different reasons; I thought the lemongrass flavor was too strong. So, not a balanced drink. Too sweet, not enough acid, too much lemongrass. 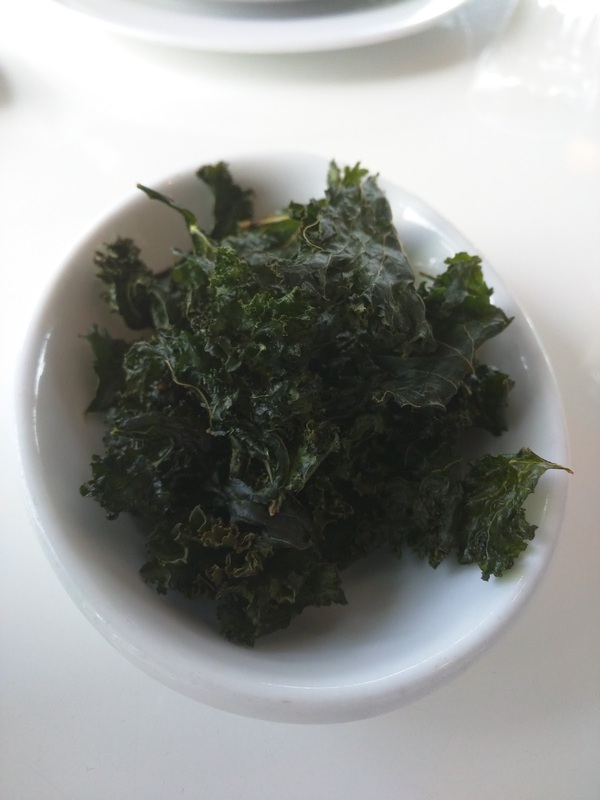 Shortly after we placed our order, a little bowl of kale chips arrived. They were fine, crispy, fresh, but I always like my kale chips to have some kind of additional flavor or seasoning. I like them covered in nutritional yeast to make them a bit "cheesy", or some spice, or, something. These were fine, just not particularly interesting. A nice touch, and a different sort of starter for sure. My tablemates gobbled them up while I was still busy settling in and taking some initial notes. "Chard wrap with shredded coconut, cashew, shiitake bacon, lime zest, shallots, ginger, chili, flavored with herb tamarind chutney." The meang kham was the dish I was most looking forward to. This I can't really explain. But for some reason, I was really craving things like chard wraps (I almost ordered collard green wraps a few days prior). I'm really not sure what got into me, but these sounded great. 4 little wraps, each inside a glass cup to hold them together, with a cute little pitcher of the chutney on the side. These were basically about two bites each. The wrapper was a fresh, crispy chard leaf, pretty easy to pick up given the way they plated it. Each wrap was filled with lots of shredded coconut (which gave it tons of crunch), a few whole cashews (even more crunch), and lime zest, shallots, ginger, and chili (so much flavor). I am not sure where the shiitake bacon was, I didn't see, nor taste it, which is sad, because that sounded great. The chutney was also incredibly flavorful. These were really quite tasty. I loved all the different textures and the incredible amount of flavor that was packed into such a small bite. Since we were a group of 4, we each got one, but I would gladly have eaten this entire platter myself. Dish of the night, and the only one I really enjoyed. $9 price might be a bit high for only 4 bites of food though. 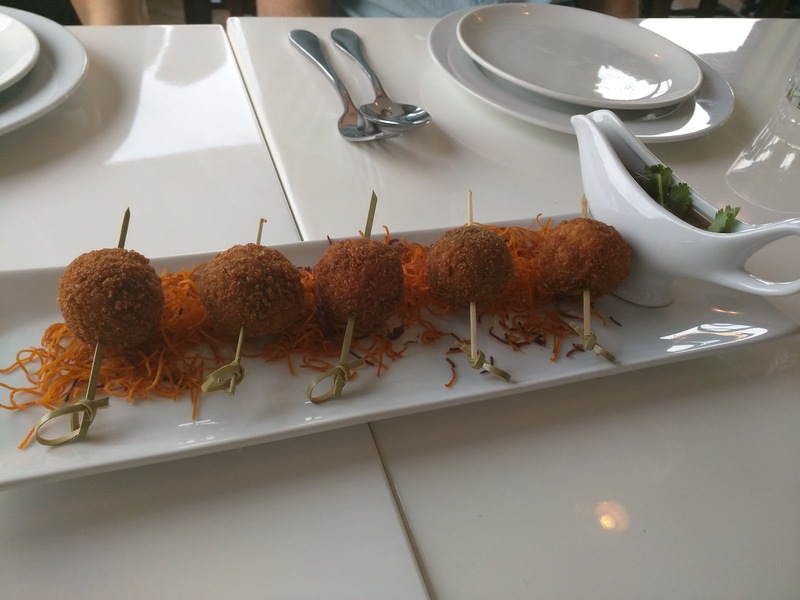 Appetizer: Mung Bean Croquette. $9. "Mung bean and mushroom Thai meatball with sweet toasted chili - cilantro sauce." 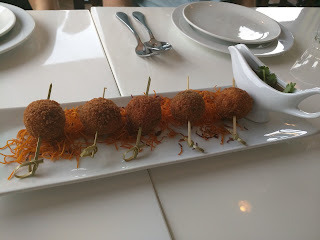 Our next appetizer was the mung bean croquettes, that I knew I wasn't interested in, but the others wanted. They were served on skewers, and like our first dish, with a cute pitcher of sauce on the side. The croquettes were clearly hot and fresh out of the fryer. The exterior was breaded, nicely crispy. But, as predicted, I didn't like the flavor. They were served on top of fried shreds of sweet potato, that I really did like. Crispy and flavorful. And the sauce was delicious, it reminded me of sweet chili sauce. I didn't like the balls themselves, but the crispy sweet potato and sauce were tasty enough to make this my second pick of the night, and my dining companions were happy to let me just scoop up all the shreds and sauce. $9 price was on par with our first appetizer, although it was interesting that this came with 5 balls, our first one with only 4 pieces. Salad: Snap Pea Thai Salad. $10. "Thinly sliced snap peas, toasted coconut, ground peanuts, crispy shallots, baked tofu, flavored with chili tamarind coconut cream." Next we moved on to a salad. Normally at a thai restaurant I order papaya salad, but reviews all said the papaya salad was fine, but pretty ordinary. But everyone raves about the snap pea salad. So we branched out and got the snap pea salad. One whole side of the plate was just lettuce, which looked like a garnish, but really did take over the plate. That was a bit strange. The other side had everything else, all mixed together. The snap peas were sliced thin, still a bit crisp. There was tons of ground peanut, far too much of it, as it overwhelmed the flavor completely. Also in the mix was more toasted coconut for some good crunch, crispy shallots, which I loved, and little cubes of tofu. The chili tamarind coconut cream dressing had a little heat to it. Overall, this was just ok. I didn't really like it, and thought it wasn't very balanced. It was Ojan's favorite dish, but my third pick of the night. $10 price was fine for a large salad. "Battered eggplant with red curry paste, bell peppers, young peppercorn and Thai basil." For main dishes, there were two that people commonly rave about: catfish eggplant and the fascinating sounding Beet Dyed Noodles I mentioned above. Since my group didn't want the noodles, we went for the catfish eggplant. It was huge chunks of battered fried eggplant, that tasted ... well, like catfish. Which isn't really a good thing. Murky. I couldn't get over how much like catfish it tasted, but, again, not actually a selling point. The curry paste was very thick, the bell peppers kinda cold, and the large pieces of peppercorn totally deadly if you got a bite full. 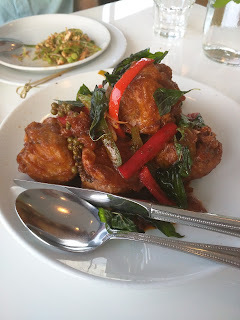 I did like the crispy thai basil on top. None of us liked this very much, but, perhaps if you like catfish this will appeal. Not pictured is the simple white rice we ordered alongside. I asked for only 2 portions, and we still had plenty left over. It was fine, basic white sticky rice. Dessert: Coconut Sticky Rice With Mango. $5. 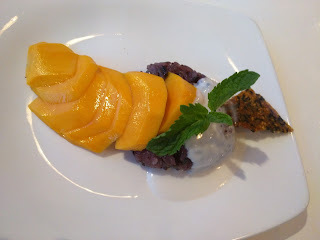 We started with a classic Thai dessert: sticky rice with mango. I've had sticky rice with mango at more restaurants than I can count, and it is always a pretty safe choice (although, of course, the mango never makes me happy anymore, as I've been ruined by the amazing mango in Sydney!). This was a pretty standard interpretation. The mango was ripe enough, sliced up, but I found it rather bitter. I really miss good mango. The sticky rice was black rice, served warm, slightly al dente so it had a crunch, nicely sticky. A good job here. The coconut cream was great, but, alas, there wasn't nearly enough of it. Seriously, see that little drizzle? That was it. Not nearly enough to even serve with half the dish. It was garnished with a sprig of mint and a sesame brittle, which also decorated the second dessert we ordered. In both cases, the sesame thing was not sweet, which was very unexpected, since it was a dessert and looked like brittle. Overall, this was lackluster. I liked the rice, and I liked the coconut cream, but there just wasn't nearly enough. Still, my favorite of the desserts, and the $5 price was good. Dessert: Taro Tapioca Pudding. $5. The second dessert was sorta the reason I wanted to go to Satdha in the first place: taro tapioca pudding. If you've read my blog for a while, you know how much I love puddings, and that I like tapioca, and go bonkers over taro. Combine them all into one dish? This clearly had my name written all over it. Sadly ... I didn't like it. It was served warm, not quite what I expected. Garnished with the same bitter sesame thing, and, randomly, asian pear slices. The asian pear really didn't seem to fit in. 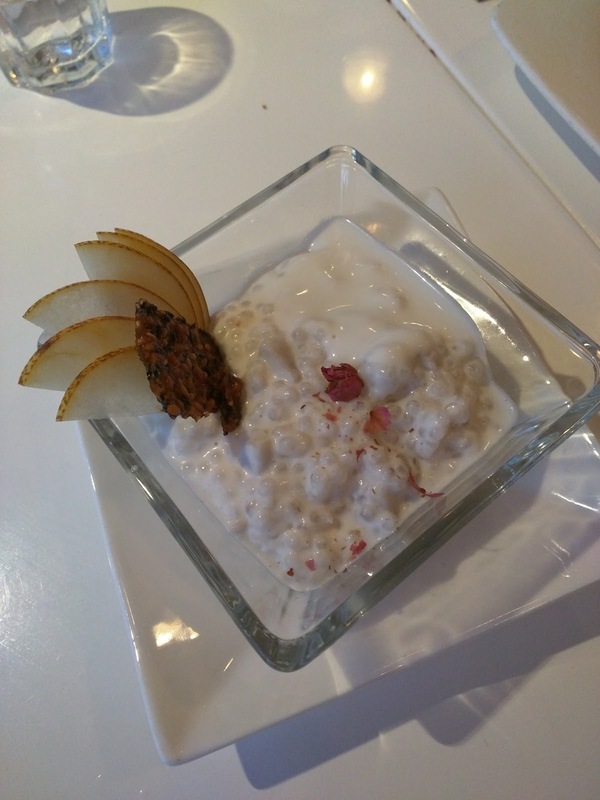 The pudding was a mix of small tapioca pearls and chunks of taro. The tapioca was well cooked, not stuck together, not hard, not too mushy. I appreciated the chunks of real taro. The pudding was creamy. But somehow, it just didn't really work for me. I didn't actually taste taro. And although creamy, the pudding didn't have much flavor. There was some coconut cream drizzled over it, but, just like the mango and sticky rice, there wasn't nearly enough. More coconut cream would have saved both these desserts. I kept trying this, since I wanted to love it, and no one else at the table was really going for it, but alas, I liked it even less than the mango and sticky rice. I wouldn't get again. The $5 price was good. The third dessert option, which we didn't opt for, was just coconut ice cream. A few years ago, I watched Top Chef Masters, and was amused by the antics of two of the chefs: Sang Yoon and Douglas Keane. Most of the contestants on Top Chef Masters were good natured, but these two seemed to always be having a bit more fun than everyone else. But, moreover, I really wanted to eat all of their dishes. Chef Keane I was familiar with. Cyrus was one of, if not the first, 2 Michelin star restaurant I ever visited. I loved it on my first visit, and was quite sad when I heard Cyrus was closing. I made it back for a final lunch, which concluded with the most insanely delicious maple bourbon glazed donuts. I'd drive all the way back if I could, just for those donuts again. But alas, Cyrus has closed down. Chef Sang I wasn't familiar with, as his restaurants are based in the Los Angeles area. He runs a fine dining restaurant, Lukshon, but also a gastropub: Father's Office. It was Father's Office that I set out to visit on my recent trip to Santa Monica. When I asked for recommendations from friends on where to eat in the Los Angeles area, every single person mentioned Father's Office. Really, a gastropub? They recommended this in the same breath as formal Michelin star restaurants. I cross-checked with Yelp. There were nearly 8,000 reviews, 4 stars. Um, ok. So people like the place. Then I saw it has its own Wikipedia entry. Known for basically 3 things: 1. 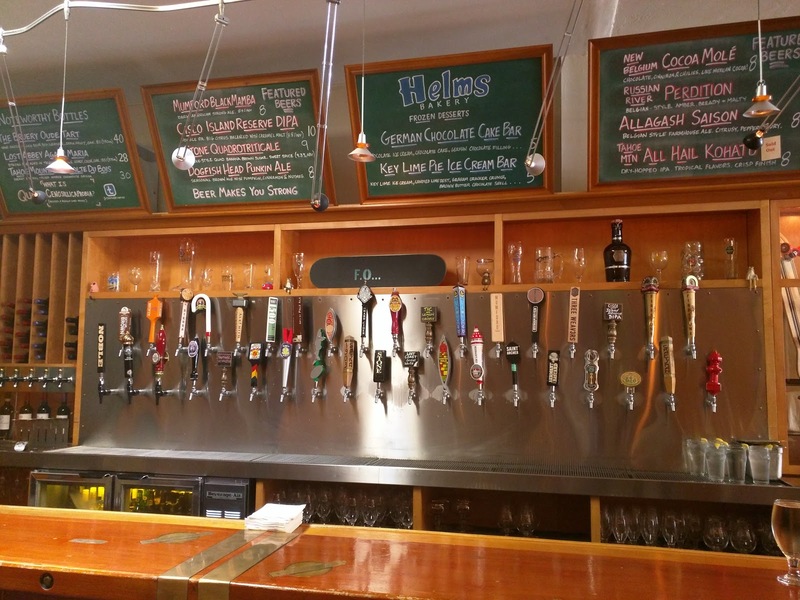 An impressive beer list, 2. The burger, 3. Absolutely no substitutions. Well, as a non-beer drinker, the beer list wasn't drawing me in. The burger is so famous it is trademarked. They do not serve ketchup, even though they have burgers and fries. I grew skeptical. These are the sort of things that lead to a lot of hype about a place, but not actual substance. I was a bit hesitant, but Sang was s cool on TV, and Emil doesn't recommended places that aren't legitimately good, so I risked it. 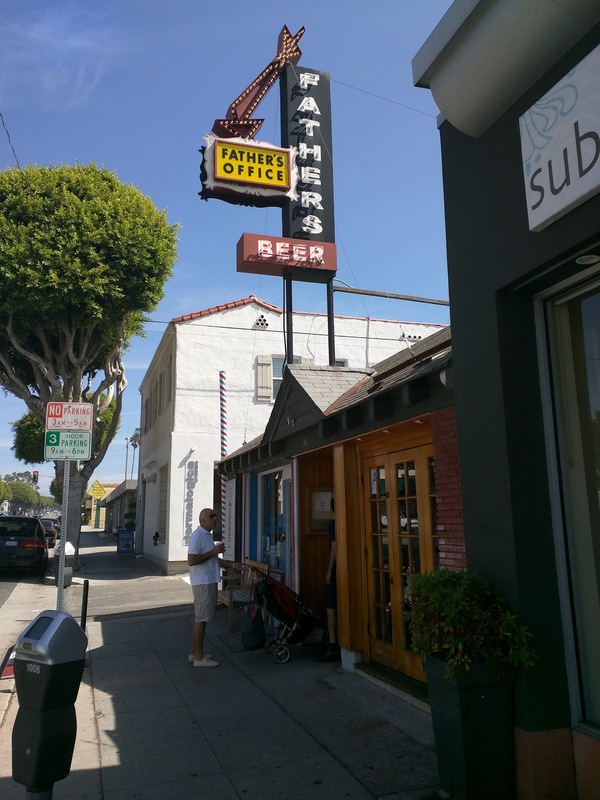 So, on our first day in the Los Angeles area, Ojan and I set out for Father's Office for lunch. Spoiler: it was great! The place was not pretentious, the food was great, the staff super friendly. I'd definitely return, and recommend it to any beer and burger lover. Father's office is about as unassuming as it gets from the outside. I think I expected something more grand, not the fairly hilarious light up generic signs, with an arrow no less. We eagerly approached the door at 11:45am, to find it ... closed. Doh. Were they closed on Sundays? On vacation? I hadn't done much due diligence in background research. Whoops. Then I saw the hours posted. They open at noon. Doh. We were over-eager (and we weren't alone, several others came, strode up to the door, and then turned away as dejected as us). So we waited, taking in the lovely fumes of Santa Monica. 15 minutes later, at noon on the dot, the doors opened. We were welcomed in, once our IDs were checked. 21 and over only. I had a moment of "wow, do I really pass for under 30?!" and then realized that they ID'ed every single person who entered. Doh. We were instructed that it was open seating, to grab a menu from the pile in front, and sit anywhere. Order at the bar when we were ready. This is not a fancy place. We picked a table near the window. The tables were simple wooden tables, with wooden chairs and benches along the wall. Wood panelling matched the tables and chairs. The wood was a funny choice of decor. It was all a light colored wood, not darker elegant fancy modern decor. Nor was it rustic. Not hip in any way. Again, I expected hip or trendy, given the hype of the place. It sorta seemed like it was designed to just be where the designer (chef Sang?) just wanted to hang out with his buddies. When I read more about it later, I found out that Father's Office existed before his involvement, and it was his favorite dive bar. This was indeed his renovation, after he took over his favorite hang out place. It showed. I started feeling more confident about our choice. 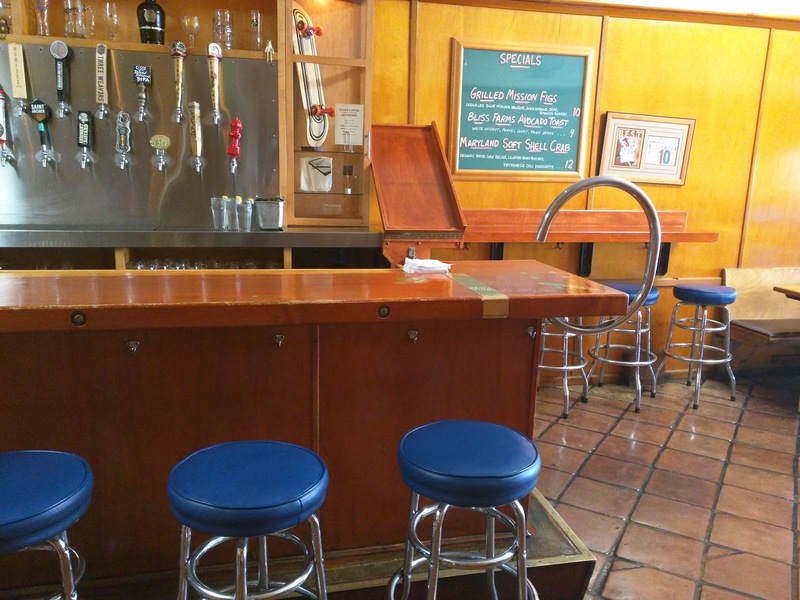 Additional seating is available at the bar, and along a second counter to the side. I noted the purse hooks, always quite welcome. 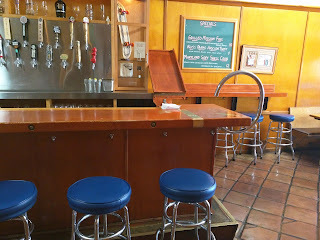 The bartender greeted us warmly when we approached. She smiled and was super friendly in every interaction. Ok, even if they don't allow modifications, they are certainly not jerks here. I grew even more confident. 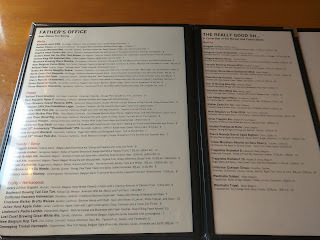 Father's Office, as I said, is a gastropub. Beer is a focus. 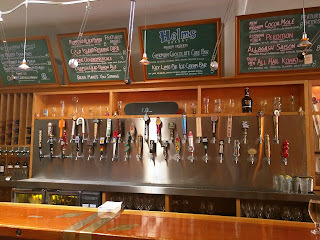 The number of taps behind the bar was quite impressive. 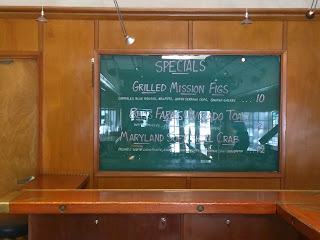 Behind the bar, the menu was also listed on the chalkboard, but we just read the plastic menus at our seats. 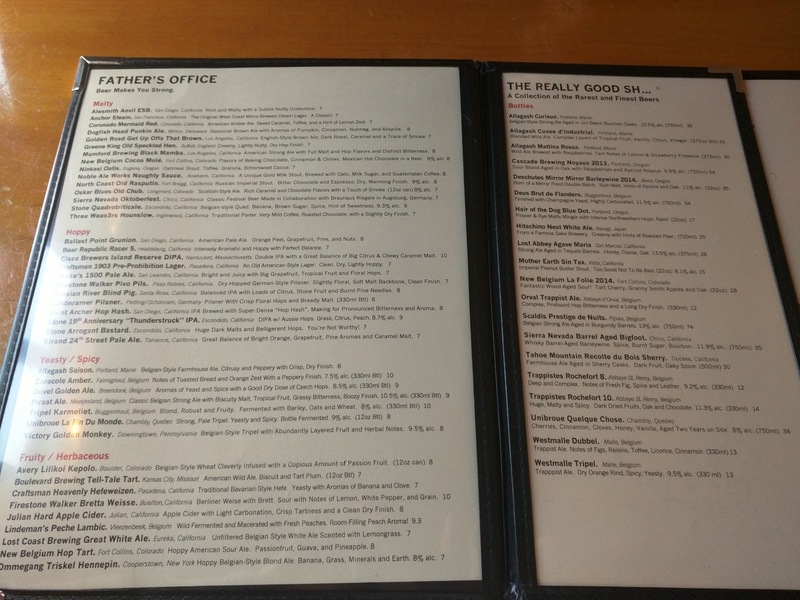 The first several pages of the menu are the extensive beer list. Sadly, beer is not my drink of choice. I hear the "Really Good Sh ..." section contains some truly spectacular beers however, if beer is for you. The wine menu is less extensive, but includes a few sparkling, white, and red, all available by the glass or bottle. 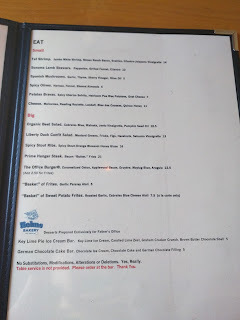 The food menu is much smaller than the alcohol menu, broken down into "small", "big", and desserts. All certainly designed to pair with beer. The "Small" offerings sound like pretty basic tapas: "Fat Shrimp", lamb skewers, Spanish mushrooms, spicy olives, patatas bravas, and assorted cheeses. We skipped this section. 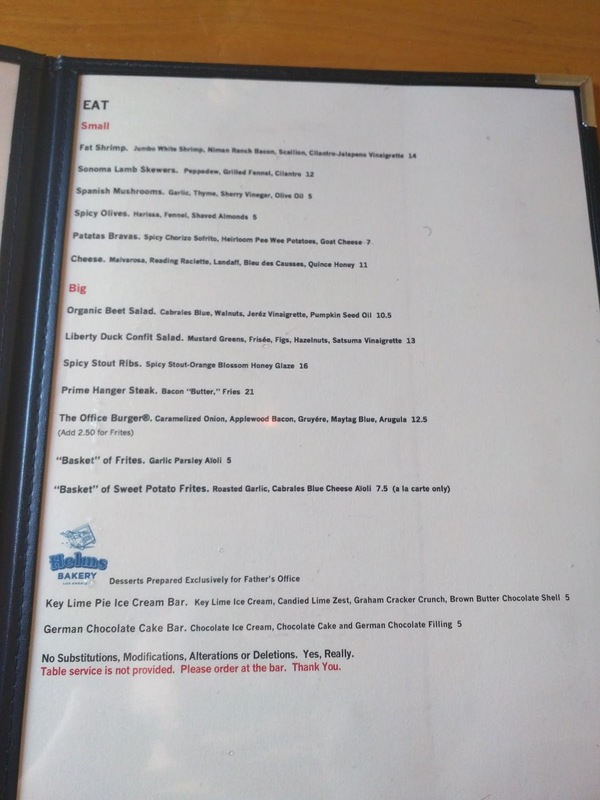 For "Big" dishes, the dichotomy between the options was striking: either the light options of salad (beets with blue cheese or duck confit), or, decadent red meat (Stout ribs, hanger steak with bacon butter, or, their famous burger). Nothing in-between here. 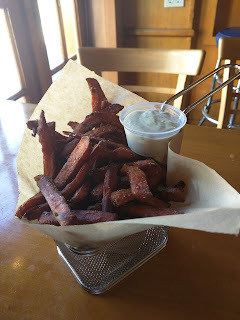 Side dishes are fries or sweet potato fries, both served with flavored aioli. Desserts come from Helms bakery, where Chef Soon also is a partner. There are only two options here, both ice cream bars: Key Lime Pie or German Chocolate Cake. A fairly short, focused, simple menu. And yes, it clearly reads that there are absolutely no substitutions, modifications, alterations, or even deletions. Don't want the cheese on your burger? Sorry. Want the nuts left out of the salad? No dice. It is what it is. Leave your picky friends behind. 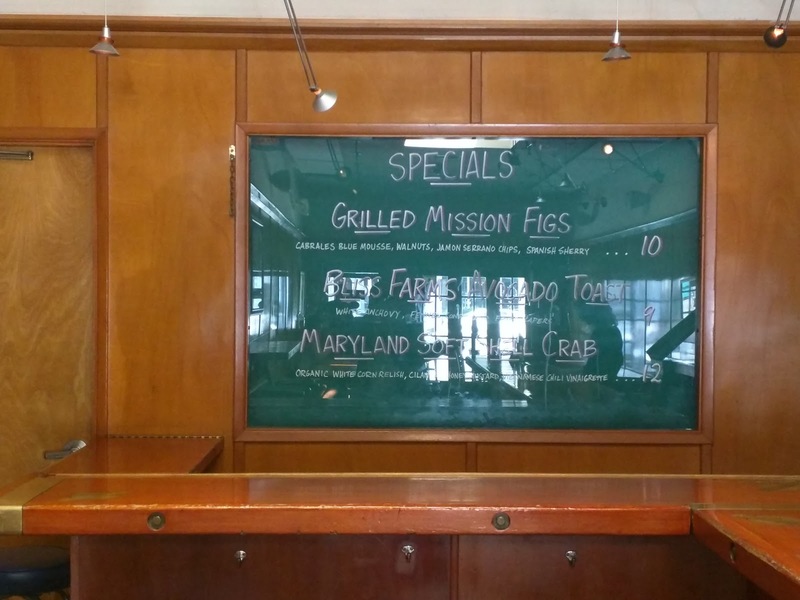 In addition to the short menu, there were three specials, posted on the chalkboard: grilled mission figs, avocado toast, and soft shell crab. 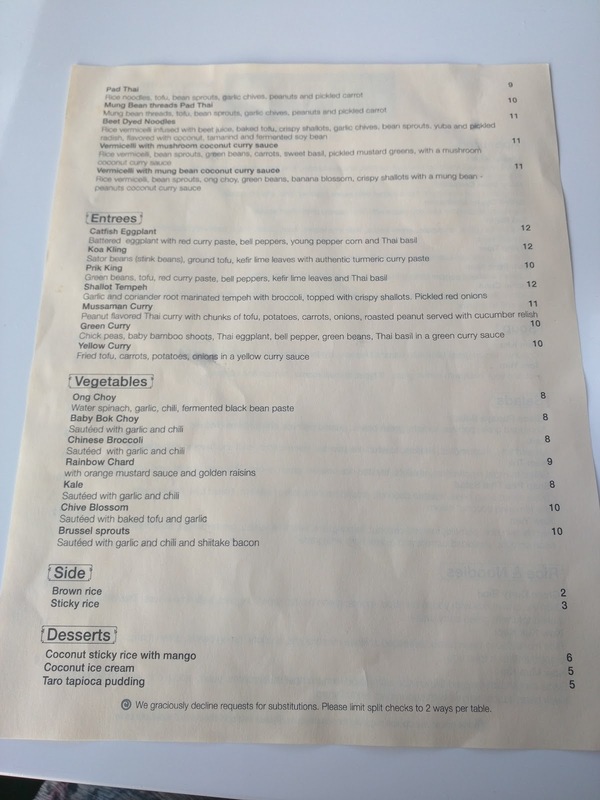 I laughed at this menu a bit, thinking of David Chang's snubbing of the West coast for our obsession with "figs on a plate" and all the hype around artisan toasts, like avocado toast. It seemed like the chef put these on the menu kinda just to laugh back. Or, at least, that is how I read it. Julian Hard Apple Cider. $8. 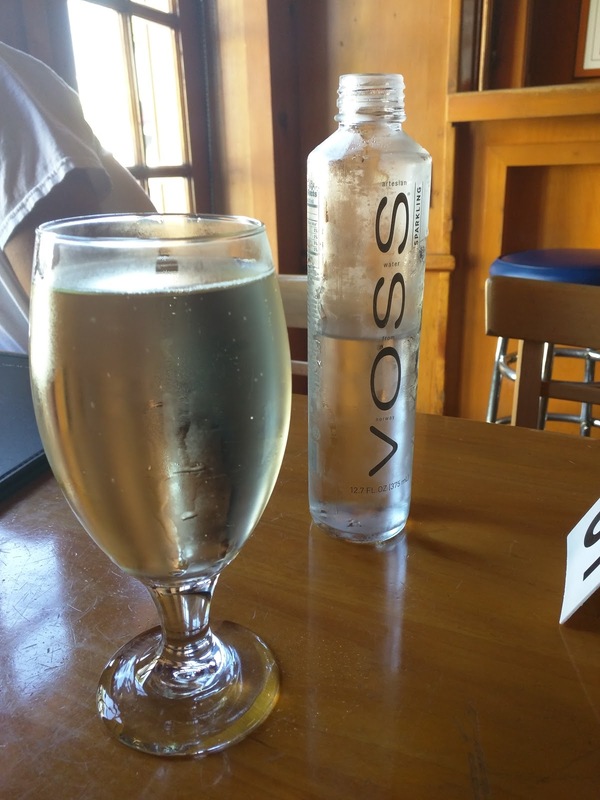 VOSS Sparkling Water. I know I'm the wrong target audience for Father's Office. Such a huge focus is the beer. The beer list is impressive. People rave about the beer list as much as they do about the burger. But, I don't like beer. As I said, they did have a small wine list, and a glass of red wine could go nicely with a burger, but for some reason, wine at 12pm felt strange to me. But I wanted something to pair with my burger. I asked what non-alcoholic options they had, and the list was short: cola, root beer, water (still or sparkling). Hmmm. I do like root beer, but that didn't really jump out at me. Then I thought to ask about cider. Cider is close enough to beer to pair well with a burger, and it wasn't the alcohol that I was trying to avoid. They had one cider on tap, Julian Hard Apple Cider. The cider was fine, but not particularly memorable. The serving was generous, particularly for $8. It did go nicely with my burger and fries, I must admit. Definitely the right choice. We also got a bottle of sparkling water, VOSS brand. It was fine too, but a bit pricy. I guess you pay for the fancy glass bottle. "Basket" of Sweet Potato Frites / Roasted Garlic, Cabrales Blue Cheese Aioli. $7.50. To go along with our burger, we obviously needed some fries. We had two choices: regular fries with garlic parsley aioli or sweet potato fries with roasted garlic and Cabrales blue cheese aioli. Regular fries can be good, but you know what is better? Sweet potato fries. Ojan wanted the regular, but ceded to the sweet potato fries, saying they were healthier, thus he was willing to make that choice for health reasons. I kinda laughed, as we were getting a crazy decadent burger and fries, citing health was a funny thing to do, but, I was getting the fries I wanted, so I left it at that. The fries arrived just a minute or two after we settled back in our table, piping hot, fresh. 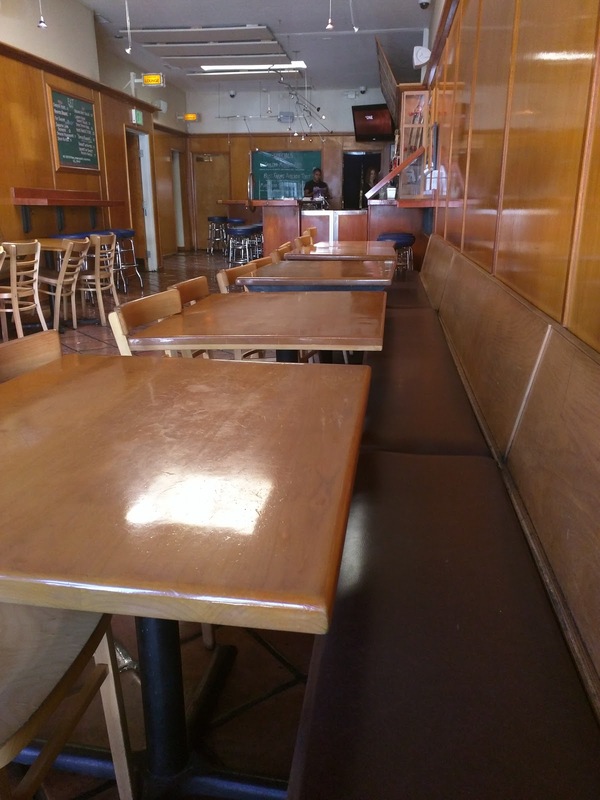 Although you order at the bar, food is brought to your table (you are provided with a number to stick on the table). The fries were served in a metal basket with a handle, on top of parchment paper, with a plastic cup holding the aioli. Again, nothing fancy here, although the fry basket as a serving vessel was kinda cute. The exterior texture of the fries was really fascinating, crispy, and I think battered? Certainly double fried. They weren't soggy, they weren't oily, they weren't limp. Decent fries. I appreciated the assortment of various fries, including little nibs that I liked fishing out, but I do prefer thicker cut sweet potato fries, as I love to taste the sweet potato more, and I like how soft and sweet the interior can be in a thicker fry. Still, these were good. When I read the description, my eyes must have glazed over the details of the aioli. I just saw "sweet potato fries" and "aioli" and I was sold. I didn't notice the "blue cheese" component. The moment I dunked a fry into the aioli though, I knew it was there. I don't hate blue cheese, but, I don't really like it either. (This is a rather new development ... I'm not sure what it is. I used to love dunking my pizza crusts in blue cheese dressing for example.) I had a few more fries, with aioli, and grew sadder by the moment. Everyone raved about the fries, and the aioli, and, well, I wasn't loving it. Then I thought about it a little. The regular fries are served with a different aioli, garlic parsley aioli. I didn't like the aioli that came with our fries due to the blue cheese, and there is no ketchup available, but what if I just tried asking for some of the other aioli? Would that count as a substitution? Would they be jerks to me about it? I rather cautiously went to the bar and asked a bit apologetically about it. "Of course! No problem!" was the response I was greeted with, and alternate aioli was quickly handed over. Phew. The garlic parsley aioli was indeed better, a decent garlic flavor, and no blue cheese in the aftertaste. But ... I still didn't love it. It is so strange, because I love aioli, and always want aioli to dunk just about anything in, but for some reason, I just didn't want this aioli either. Maybe the aioli just didn't go great with the sweet potato fries? After only about 10-15 fries, our burger arrived, and I turned my focus to the amazing burger in front of me. Once I finished, I half-heartedly came back to the fries. We had so many left. They were staring at me, even if I didn't love them. And Ojan didn't want more, as he wasn't into the sweet potato fries from the start. So I tried again. I actually think they got better as they cooled down, as strange as that seems. I discovered that they were quite delicious just on their own. I didn't need the aioli. In fact, they were better without it. I could taste the lovely sweet potato flavor more this way. A few minutes later, as I realized how many I had just crammed into my mouth, I realized they certainly grew on me. I was enjoying them now. Crispy exterior, decent flavor, not oily, not soggy. I just wished for a different dipping sauce. Regular fries are $5, or $2.50 with the burger, but sweet potato fries are only available a la carte, as a full basket, for $7.50. I'm not sure if the quantity changes or not, I would hope so. $7.50 isn't really high if you think of it as an appetizer, and the basket could easily be shared by 2-3 people, but as a single person, this would be far too much. Ojan and I struggled to take it down. I would prefer a side portion, like they offer with the regular fries. And now for the main attraction The Office Burger. It has been named the country's best burger by several publications, including Esquire magazine and the Today show. It ... didn't look like much. Also served simply, in a metal basket, on top of paper. The bun didn't look like a normal burger bun, and it wasn't even round. An oval burger? The burger came cut in half, and an extra plate was provided without our even asking. Splitting this burger seems to be common practice, as I observed nearly every couple in the place doing the same. Taking down a whole burger by yourself would certainly be do-able, but if you wanted fries too, and didn't want quite such a heavy lunch, splitting seemed very reasonable. The Office Burger: Cross Section. "Caramelized onion, applewood bacon, gruyere, Maytag blue, arugula". I took my half, and admired the cross section. Ok, this was a serious burger. 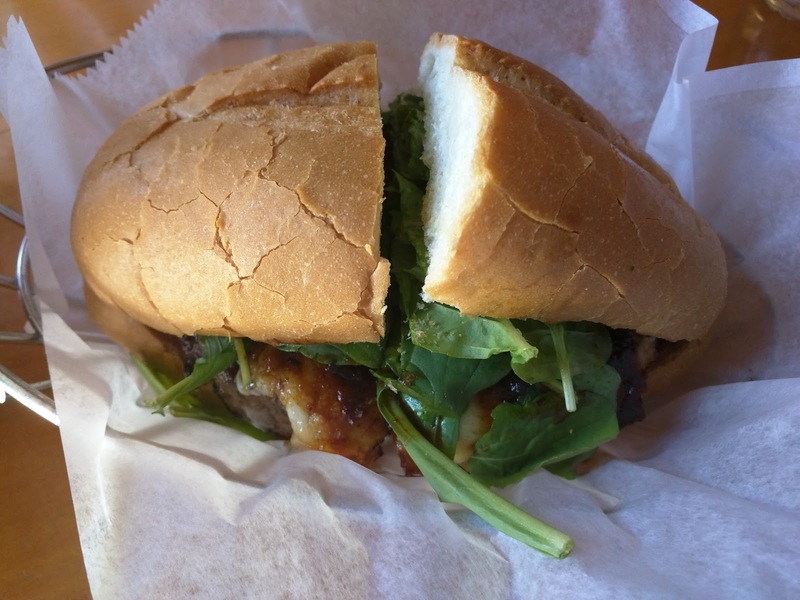 Of course, the first thing my eyes took in, after I got over the fact that the burger wasn't round and the bun was strange, was the generous pile of arugula. Below that I could see the good stuff: cheese and caramelized onions. And under that? A very juicy looking burger. Ok, things were seriously looking up. I clearly must have spent more time admiring it, and taking it in, than I realized, as before I even picked my half up, Ojan had devoured half of his. Actually, I think the burger was just that good. He took one bite, and didn't come up for air, except for to moan something about that being a really good burger. I dove in. And agreed, instantly. This is, indeed, a damn good burger. I'll start with what I didn't like though. That bun! It looked like the kind of bun you use on a cheesesteak. It didn't seem very toasted, and it just wasn't interesting. I wanted ... brioche? Or something special. Or if not fancy, how about just a regular bun? But Ojan said he really liked it, it reminded him of a cheesesteak, and it worked well for him. I tolerated the bun at first, but eventually went open-faced, choosing to fill my stomach with more sweet potato fries, rather than this bun. Now for the main attraction: the burger patty. Cooked on a charbroiler. It was, well, ridiculously perfectly cooked. The char on the outside was incredible. Super crispy, smoky. Yet inside it was still very moist, medium-rare. The meat itself tasted good, 100% chuck, they dry-aged it themselves. Good product for sure, and that char ... swoon. This patty, with just some ketchup, would have been a winner on its own. But the burger most certainly did not stop there. On top of the patty was a slew of ridiculously flavorful components. The caramelized onion showed up in a onion-bacon compote spread on top, not just a few pieces of onion. This is also where the bacon (chopped up and cooked into it) was hiding, again, just like the onion, no strips of bacon perched on top as I expected. This stuff was amazing. It packed so much flavor, and caramelized onions go soooo well with cheese and beef. Oh yeah, the cheese. I loved the gruyere, it was perfectly melted, there was tons of it, totally decadent. When you took a bite, it was easy to pull away with cheese hanging out of your mouth. Soo good. Beef, caramelized onions, and gruyere? This was starting to remind me of french onion soup, making the bread choice make a bit more sense actually. The blue cheese was creamy and added a nice texture, but, I wasn't into the blue cheese. I admit that the flavors all worked together, but, not liking blue cheese, I wished it wasn't there. Ojan really liked the blue cheese though, and often puts blue cheese on burgers anyway. And finally, the pile of arugula. 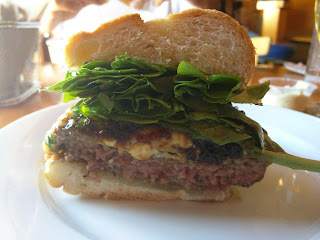 It may have looked silly, but the freshness and lightness helped balance the burger. It also wilted as it warmed up from the heat of the burger, and shrunk down considerably. So, overall? Yes, this is a grand burger. I see why everyone loves it. Would I do things different? Yes, I'd ditch the blue cheese, and swap out the bun. But the char on the burger, that ridiculous caramelized onion-bacon compote, and the decadent gooey gruyere were enough to still net this a solid 5 star rating from me too. Believe the hype. This is a very well conceived, damn good burger.